The SolrCloud architecture is designed to support Near Real Time Searching (NRT) searches on a Solr collection usually consisting of multiple nodes in a single data center. "CDCR" augments this model by forwarding updates from a Solr collection in one data center to a parallel Solr collection in another data center where the network latencies are greater than the SolrCloud model was designed to accommodate. CDCR supports replicating data from one data center to multiple data centers. The initial version of the solution supports a uni-directional scenario where data updates are replicated from a Source data center to one or more Target data centers. The Target data center(s) will not propagate updates such as adds, updates, or deletes to the Source data center and updates should not be sent to any of the Target data center(s). Source and Target data centers can serve search queries when CDCR is operating. The Target data centers will lag somewhat behind the Source cluster due to propagation delays. Replication supports both a new empty index and pre-built indexes. In the scenario where the replication is set up on a pre-built index in the Source cluster and nothing on the Target cluster, CDCR will replicate the entire index from the Source to Target. This functionality was added in Solr 6.2. The uni-directional nature of the initial implementation implies a "push" model from the Source collection to the Target collection. Therefore, the Source configuration must be able to "see" the ZooKeeper ensemble in the Target cluster. The ZooKeeper ensemble is provided configured in the Source’s solrconfig.xml file. CDCR can be configured to replicate from one collection to a second collection within the same cluster. That is a specialized scenario not covered in this document. A group of networked servers hosting a Solr cluster. In this document, the terms Cluster and Data Center are interchangeable as we assume that each Solr cluster is hosted in a different group of networked servers. Here is a picture of the data flow. Upon successful application of the data update on the local index, the data update is added to the Update Logs queue. One implication of the architecture is that the leaders in the Source cluster must be able to "see" the leaders in the Target cluster. Since leaders may change in both Source and Target collections, which means that all nodes in the Source cluster must be able to "see" all Solr nodes in the Target cluster so firewalls, ACL rules, etc., must be configured to allow this. The current design works most robustly if both the Source and Target clusters have the same number of shards. There is no requirement that the shards in the Source and Target collection have the same number of replicas. The CDCR REST API is the primary form of end-user communication for admin commands. A SolrJ client is used internally for CDCR operations. The SolrJ client gets its configuration information from the solrconfig.xml file. Users of CDCR will not interact directly with the internal SolrJ implementation and will interact with CDCR exclusively through the REST API. CDCR replicates data updates from the Source to the Target data center by leveraging the Update Logs. If for some reason, the Target data center is offline or fails to process the updates, the thread will periodically try to contact the Target data center and push the updates while buffering updates on the Source cluster. One implication of this is that the Source Update Logs directory should be periodically monitored as the updates will continue to accumulate amd will not be purged until the connection to the Target data center is restored. SolrCloud already provides a unique identifier for each update operation, i.e., a “version” number. This version number is generated using a time-based lmport clock which is incremented for each update operation sent. This provides an “happened-before” ordering of the update operations that will be leveraged in (1) the initialization of the update checkpoint on the Source cluster, and in (2) the maintenance strategy of the Update Logs. The CDCR replication logic requires modification to the maintenance logic of the Update Logs on the Source data center. Initially, the Update Logs acts as a fixed size queue, limited to 100 update entries by default. In the CDCR scenario, the Update Logs must act as a queue of variable size as they need to keep track of all the updates up through the last processed update by the Target data center. Entries in the Update Logs are removed only when all pointers (one pointer per Target data center) are after them. 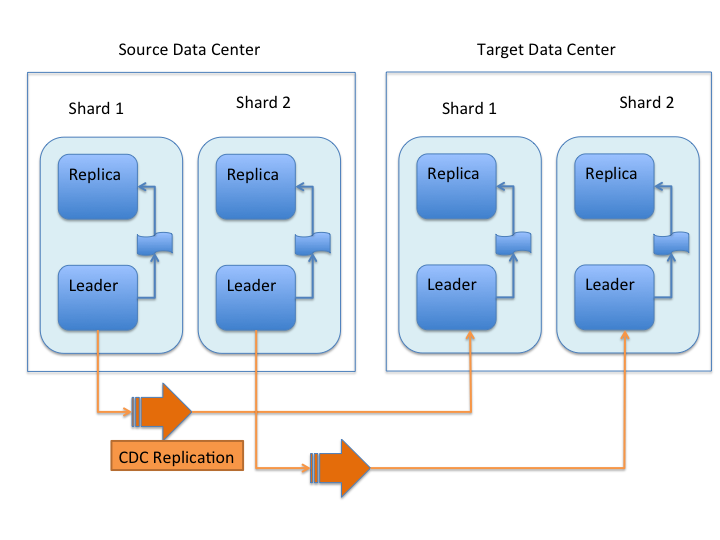 The CDC Replicator is a background thread that is responsible for replicating updates from a Source data center to one or more Target data centers. It is responsible in providing monitoring information on a per-shard basis. As there can be a large number of collections and shards in a cluster, we will use a fixed-size pool of CDC Replicator threads that will be shared across shards. CDCR is currently only uni-directional; data is pushed from the Source cluster to the target cluster. There is active work being done in this area to remove this limitation. Configuration files (solrconfig.xml, schema etc.) are not automatically synchronized between the Source and Target clusters. This means that when the Source schema or solrconfig.xml files are changed, those changes must be replicated manually to the Target cluster. This includes adding fields by the Schema API or Managed Resources as well as hand editing those files. The Source and Target configurations differ in the case of the data centers being in separate clusters. "Cluster" here means separate ZooKeeper ensembles controlling disjoint Solr instances. Whether these data centers are physically separated or not is immaterial for this discussion. Here is a typical Target configuration. Target instance must configure an update processor chain that is specific to CDCR. The update processor chain must include the CdcrUpdateProcessorFactory. The task of this processor is to ensure that the version numbers attached to update requests coming from a CDCR Source SolrCloud are reused and not overwritten by the Target. A properly configured Target configuration looks similar to this. The host address for ZooKeeper of the Target SolrCloud. Usually this is a comma-separated list of addresses to each node in the Target ZooKeeper ensemble. This parameter is required. The name of the collection on the Source SolrCloud to be replicated. This parameter is required. The name of the collection on the Target SolrCloud to which updates will be forwarded. This parameter is required. The CDC Replicator is the component in charge of forwarding updates to the replicas. The replicator will monitor the update logs of the Source collection and will forward any new updates to the Target collection. The number of threads to use for forwarding updates. One thread per replica is recommended. The default is 2. The delay in milliseconds for the monitoring the update log(s). The default is 10. The number of updates to send in one batch. The optimal size depends on the size of the documents. Large batches of large documents can increase your memory usage significantly. The default is 128. The delay in milliseconds for synchronizing the update logs. The default is 60000. The state of the buffer at startup. The default is enabled. When buffering is enabled, the Update Logs will grow without limit; they will never be purged. During normal operation, the Update Logs will automatically accrue on the Source data center if the Target data center is unavailable; It is not necessary to enable buffering for CDCR to handle routine network disruptions. For this reason, monitoring disk usage on the Source data center is recommended as an additional check that the Target data center is receiving updates. Buffering should not be enabled on the Target data center as Update Logs would accrue without limit. If buffering is enabled then disabled, the Update Logs will be removed when their contents have been sent to the Target data center. This process may take some time. Update Log cleanup is not triggered until a new update is sent to the Source data center. The status of the process and an indication of whether the buffer is enabled. The status of CDCR and an indication that the buffer is disabled. The status of CDCR, including the confirmation that CDCR is stopped. The “queues” object also contains information about the update logs, such as the size (in bytes) of the update logs on disk (“tlogTotalSize”), the number of transaction log files (“tlogTotalCount”) and the status of the update logs synchronizer (“updateLogSynchronizer”). The output is composed of operationsPerSecond which contains a list of (ZooKeeper) target hosts, themselves containing a list of Target collections. For each collection, the average number of processed operations per second since the start of the replication process is provided. The operations are further broken down into two groups: add and delete operations. The output is composed of a list “errors” which contains a list of (ZooKeeper) target hosts, themselves containing a list of Target collections. For each collection, information about errors encountered during the replication is provided, such as the number of consecutive errors encountered by the replicator thread, the number of bad requests or internal errors since the start of the replication process, and a list of the last errors encountered ordered by timestamp. Solr 6.2, added the additional functionality to allow CDCR to replicate the entire index from the Source to the Target data centers on first time startup as an alternative to the following procedure. For very large indexes, time should be allocated for this initial synchronization if this option is chosen. This is a general approach for initializing CDCR in a production environment based upon an approach taken by the initial working installation of CDCR and generously contributed to illustrate a "real world" scenario. Customer uses the CDCR approach to keep a remote disaster-recovery instance available for production backup. This is a uni-directional solution. Customer has 26 clouds with 200 million assets per cloud (15GB indexes). Total document count is over 4.8 billion. Source and Target clouds were synched in 2-3 hour maintenance windows to establish the base index for the Targets. As usual, it is good to start small. Sync a single cloud and monitor for a period of time before doing the others. You may need to adjust your settings several times before finding the right balance. Before starting, stop or pause the indexers. This is best done during a small maintenance window. Include the CDCR request handler configuration in solrconfig.xml as in the below example. Sync the index directories from the Source collection to Target collection across to the corresponding shard nodes. rsync works well for this. Start the SolrCloud on the Source side. As a general rule, the Target (DR) side of the SolrCloud should be started before the Source side. Network and disk space monitoring are essential. Ensure that the system has plenty of available storage to queue up changes if there is a disconnect between the Source and Target. A network outage between the two data centers can cause your disk usage to grow. Tip: Run a test. With moderate indexing, how long can the system queue changes before you run out of disk space? With CDCR, the Target ZooKeepers will have connections from the Target clouds and the Source clouds. You may need to increase the maxClientCnxns setting in zoo.cfg. When rolling in upgrades to your indexer or application, you should shutdown the Source (production) and the Target (DR). Depending on your setup, you may want to pause/stop indexing. Deploy the release or patch and renable indexing. Then start the Target (DR).